I have a lot of catching up to do with blogging my senior and family sessions! I’m going to try and do two a week until I’m caught up! What a season I had! Starting this week with Sam! 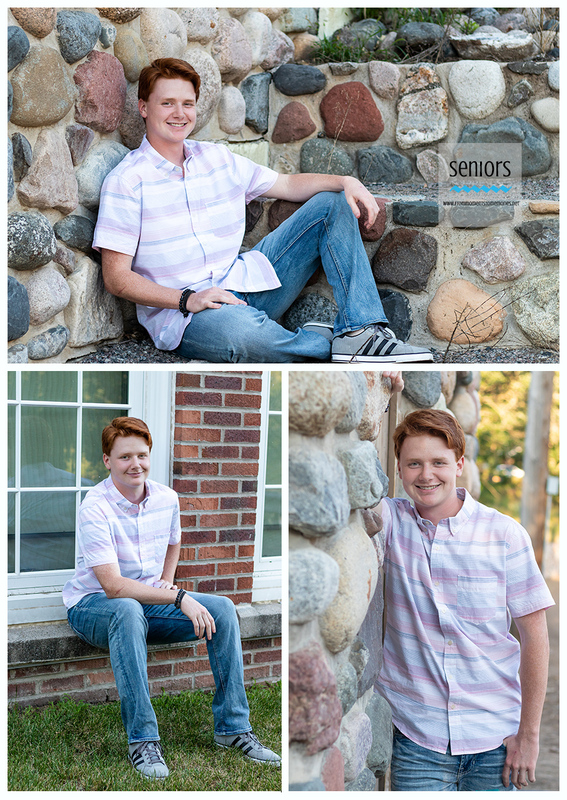 Sam is a senior at Elk River High School and a member of the Class of 2019. He also plays baseball AND basketball, and is a member of the National Honor Society. Sam describes himself as funny and self-loving! We started out at Handke School and the Pit near Downtown Elk River. Sam was looking for a suburban look for his senior session, but not overdone. He wanted nice and simple! And I believe that’s what he got! He chose Elk River because it’s the place he calls home. Its his last year here, and wanted to show the place some love! I asked Sam what one piece of advice he would have to other seniors getting their picture taken. His response? He advises other high school seniors to prepare in advance for the session. “Get your clothes picked up as soon as possible, don’t wait like me choosing two days before!” I would have to agree! There is less anxiety if you prepare well in advance! Good luck in everything you do, Sam! Thank you for trusting me with your senior photos! I'd like you to meet Heather! I was so excited when Heather's mom, Chris, contacted me to do Heather's senior photos. A couple of years ago, I was fortunate to take Heather's older sister, Jadyn's senior pictures. I love repeat customers who trust me! Heather is a senior at Elk River High School, a studio dancer, and is also a member of the Elk River Dance Team. She describes herself as fun-loving, caring and laid back. I couldn't agree more! Heather was looking for a more natural, look with a mixture of country and urban locations. We decided on Henry's Woods Park in Rogers; Downtown Elk River, including Handke Pit; and the William H. Houlton Conservation Area in Elk River. I had just picked up this awesome changing tent for my seniors to use this year. I was sick of them (and I am sure they were, too) trying to find a place to change and/or changing in the car all the time. I have also been showing behind the scenes of my senior sessions on Snapchat and Instagram this year. It has been a hit with the seniors, and they are having a blast with it. Unfortunately, my assistant was under the weather the day of Heather's shoot so I was on my own with that part of the session. The only behind the scenes photo I could salvage was of her mom helping me with the tent! Looking good, Chris! We actually started out at their house. They have a beautiful pond/water arrangement in their yard and Chris had asked if we could incorporate it into her senior session. The featured photo above shows how Heather meticulously picked her outfits and they were perfect for her! I think she looks like Jadyn in that photo! We headed over to Henry's Woods next. It has been very popular with families and seniors this year! I loved the outfits and accessories Heather chose. She brought a hat, necklaces, and different shoes for each outfit. She had a mixture of casual, high sophistication and country. Perfect! The next stop was Downtown Elk River. Chris made a great assistant helping me with my diffuser/reflector. Heather told me after that her biggest fear or worry about the photo shoot was being uncomfortable during the session, but that I did a great job making sure that didn't happen! Thanks, Heather! Look how relaxed and comfy you look! You did an awesome job! And that Golden Hour sun was amazing! We headed over to Handke Pit and did dance pictures next. So graceful! The lighting was really beginning to impress! And finally, we ended up at the Houlton Conservation Area. I had used this location in the past when it was Houlton Farm. However, the owner of the farm sold it to the city and the city turned it into a nature conservation area. It has become one of my favorite locations and was perfect for Heather's country theme! Heather's advice for other seniors preparing for their senior shoot? "Be as prepared as you can be and make sure the pictures are a reflection of your true self. Definitely pick your outfits carefully and have a good idea of which accessories you will want." Smart words! Heather plans to attend a four-year university and major in either education or criminal justice/law, while participating on a college dance team! Good luck, Heather, I know you will do great things! "Sheila did a wonderful job and made it all so easy for me!" And that, my friends, is why I love my job!